There are others, like traveling, going to the spa, cuddling with my pups, seeing friends, and the like. I'm not even mentioning life and times with The CEO (as we know he is the light of my life in general and would start as number one on any list). And I haven't been blogging. I have been soaping, cooking, and knitting but not blogging about it. And when I started to think about writing about knitting, which I really want to do sometimes, I thought "enough Erin." And that's when I had the idea to merge everything into one. So from now on, you'll hear about all of my adventures. There will be lots of soap, tons of food, and heaps of yummy yummy yarn. I might even climb on my soap box occasionally. So please hang in there and point your browser to ekcantcook.blogspot.com where the fun times will continue! See you soon (and hopefully more often). Well, I suppose I buy tons of things just for me...but last night I got an email newsletter from one of my favorite Etsy Stores: For Strange Women. I love this shop and have gazed longingly at Jill (from the shop's) amazing creations. I've read her blog, I absorb her newsletters, I like the stuff so much I liked her on Facebook. I don't do this often as I like to see what my friends are saying as opposed to business, but she keeps it reasonable and refreshing. For the birthday of one of The CEO's family members, I got her a fragrance locket and loved it so much. I was also incredibly impressed with Jill's flexibility and kindness. I found her customer service to be impeccable. And that's saying something with the recent decline in this on Etsy. But I never bought anything for myself, until now. Last night's newsletter announced the sale (or reminded those more in the know than me) of her Lunar Amulet. Each month, a new artisan perfume comes for my amulet (which I also get as a part of this deal). Jill blogs about the scents and I looked back and last year's. They are thoughtful and like a small, scented piece of her life. As all of you know, having this insight into the life of a creator is such a huge draw for homemade goods for me. So, I agonized over the price until my boyfriend offered to buy it for me (usually a sure sign he can tell I really want it and I am being silly). So I bought it myself. And I intend to tell you all about it. Further, I realized that I am now receiving each month the Glossybox, Ipsy, Birchbox, and sometimes even bonus boxes from Influenster. I should tell you about what I get. It isn't handmade, so will be a bit of a departure. And I promise to only tell you about the stuff I am loving. And I will, OF COURSE, be reviewing all of those new soaps. A few months back, I was tooling around Williamsburg, Brooklyn and came across a booth at a market where a woman was selling soaps. I instantly started sniffing them and my companion told me to pick some out. I think I got three or four bars total but one in particular really called out to me. I began talking to the lady at the booth and, as it turns out, they are her soaps. I told her about my blog, we bonded a moment and I went along my merry way. The name of the soap company is The Southampton Soap Company. Made in the Hamptons, these are small batch soaps made with loving care and no animal products. And you can tell that in everything from the soap maker's smile to the presentation. I was beyond excited to give one bar a whirl. The first one I tried was Seaside Spa. It is made with water local to the Hamptons, sea clay, and sea vegetables. Embedded in it is what appear to be black sesame seeds. I cut off a chunk and fired it up. And ended up using it until it was all gone. I like this soap a bunch. It took some adjustment at first as it doesn't get super slippery when wet (I know, I kno...bad reference). But the moisturizing properties of the clay start to really work and you forgive the extra effort to rub the soap on your skin. The seeds provide an exfoliant that isn't too abrasive but gets the job done nicely. And the scent is great for those who like something light but that doesn't cling to the skin. As I said, I used the sliver until it was gone...and it lasted awhile. I have a few others to try, which I will totally review. In the meantime, if you don't live in NY, you can order through Southampton Soaps' Etsy Store. I know I've said it before but I really really neglect this blog. I'm still obsessed with soap and have so many to try. I also have so much to share. I've bought soap in Montana, Wyoming, and Brooklyn lately. I bought Etsy soap for the man in my life that smells epic. I've joined GlossyBox, BirchBox, and MyGlam...and I promise to tell you all about my adventures in subscription sample boxes. (So far, awesome). I will also send you some reviews on the soaps I have been trying. I've met some soapers who deserve props (and business). But, before I get to all of that...I wanted to tell you about a very nice surprise gift I got. This is subtitled "QVC honestly does rock!" After coming back from an awesome trip to the Wild West, T and I went to visit his family in PA. When we arrived, there was a lovely lovely gift waiting for me from his mother. Have I mentioned on this blog yet how much I adore his family? I hear people complain about "in laws" and the family of their significant others and laugh. I am the luckiest girl in the world. Along with a very nice note, I received three Soap Rockettes from T's mom. These are really really neat. She gave me the Balance set of three (which I really needed as I have been so off kilter lately). There are three rockettes in Green Garnet, Red Garnet, and Tanzanite. I LOVE tanzanite. I cannot get enough of it. Now I have soap that looks like it. I was so excited to get home and try these! Here is the set, along with the informational brochure that came with them. Soap and Gems? I die! Naturally, I went for the tanzanite first. I even took some pictures before I used it. That's unusual for me lately. Not only am I a terrible photographer, I am a neglectful one. It looks like a giant tanzanite. Again, I DIE! These are glycerine soaps and the ingredient list isn't alarming long. The scents are clean and strong. 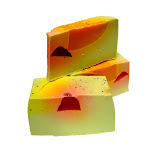 Some reviewers have complained that the scent is overpowering but I really like a strongly scented soap. I find that they deliver a wonderful shower experience without clinging to the skin so as to overpower a perfume. The scent of tanzanite is called "starry night" and is floral and wonderful. There is a great lather on this soap, it is substantial enough to hold onto and I can even use it for shaving. All up, I liked these and can think of several people who would enjoy them as gifts. I will let you know how the garnets work out but I know I won't be disappointed. Soap as gifts rule. Wait until you hear what I got for my birthday! My hair isn't naturally purple/auburn. The problem with 1. red hair and 2. dark dyed hair is that the color fades...FAST. So most of my color has gone to turn the tub pink. 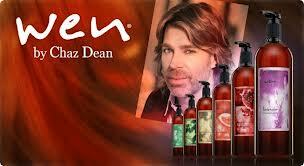 And then one day I was walking the treadmill at the gym and started watching the Wen by Chaz Dean infomercial. It was like 6m and it was on. Alyssa Milano was babbling on about how fabulous her hair looked and I didn't care because she would look fabulous in a potato sack after not showering for a month. But the idea of a non shampoo hair cleanser stuck with me. And then, a few months ago, frustrated that even my sulfate free hair products were washing out my color, I decided to go online and order some Wen. I got the intro kit in lavender which had the conditioning shampoo, the replenishing mask, the replnishing mist, the styling dreme, the balm and a comb for $35. Not bad, right? Except they apparently cannot get it to you to save their ever loving lives. First they sent it to some wonky address that didn't even match the one I specified. And I had to call them to tell them that I didn't get it and it had been returned. They were nice enough and offered to expedite me another shipment and refund my money. That's sweet. EXCEPT THEY SCREWED UP THE ADDRESS AGAIN (even after we went over it on the phone). The shipment arrived somewhere, we just don't know where and since they don't ask for signature, we never will. I told them to fuhgeddaboutit. And then I was hanging with my Dear BF's fantastically awesome mother who happens to love QVC (as do I) and I asked her if she had tried Wen. She had! She liked it AND it was Today's Special Value. So she loaned me her conditioning shampoos to try the next morning and then she, her awesome husband and my darling convinced me to buy some from the Q. The next day I tried her Fig scented and made my BF try the tea tree. And you know what? My hair had never felt better. And then MY shipment arrived from QVC in about 3 days (because they have it together...Chaz should fire his own people and work exclusively through the Q...for serious). And I've been addicted ever since. I got the BIG BIG bottle of cleansing conditioner, some travel packs of that too (very useful for upcoming WY vacay), a bottle of the Replenishing Treatment Mist, and the Re-Moist Hydrating Mask...all in lavender. I have never loved my hair more. It is silky, I can always comb my fingers through it, it smells fantastic and I am an addict. I want to use it twice a day but try for every third day. My hair is not getting greasy but I am careful rinser. Guys, I know I am not one for commercial products, but I ADORE THIS STUFF. And want to try the other products. Just do yourself a favor and order through QVC. And now, if you will excuse me, I am off to wash my hair. I'm broke, folks. Well, sort of, anyway. And there is a great reason but I can't tell you yet. Anyway, I just noticed that one of my most coveted shops, Margarita Bloom is having a 15% off your ENTIRE order sale until the end of August. For the love of Nancy, please go order stuff and write me and tell me about it. I am a champion soap slacker. I have been so involved over at the FOOD blog that I didn't get myself together very quickly on this one. I've been eyeing my new Angelic Soaps daily and not mustering the photo taking time to make a bath possible. Well, last night I did. . I adore the packaging. The soaps are in individual little gold net bags and cards identifying them inside. It must be a high touch process and its worth it, in my opinion. Getting these soaps felt extravagant. The soaps themselves (and I will talk about them in two separate blog posts) are gorgeous. Much care obviously goes into the work and it shows. The bad photography doesn't do this soap justice. It is a deep pink/almost red color and has gold sparkles throughout. I am hesitant to show you this next photo as my skills are seriously bad here but it illustrates the top of the bar, which may be my favorite part. And it smells divine. Like jasmine but NOT like jasmine perfume, if that makes sense. The scent is incredibly strong when sniffing the soap and in the shower but, when it dries on your skin, there is just enough scent to remind you of the awesome shower you took that morning. The texture on this one is definitely different that what I am used to using. I realize that this is probably due to the massive amounts of shea butter in it. You have to get this soap really wet to get it working against your skin and the lather is think and not conventionally "soapy" at all. But it rinses cleanly and smells so amazing during the shower.